Like many cities around the world, getting around as a pedestrian is quite normal in San Diego. Taking advantage of the amazing weather temps, I’ve been walking in a new direction almost each day to simply explore. From my front door, going south is the famous Balboa Park; to the north is the wonderfully hip neighborhood, University Heights that has wall-to-wall, trendy, craft breweries and restaurants; to the west is Hillcrest, the PRIDE of the city; and to the east is the neighborhood of North Park, full of good eateries and unique shops, but also brimming with Craftsman cottages and bungalows. No matter which direction I go, there is always much to see. Out on the streets, it doesn’t take long to notice the assortment of beautifully painted public art murals on the sides of buildings. These handcrafted masterpieces are available for all to enjoy and when I walk past, I can’t help but grab my camera. Located at the intersection of University Avenue and Richmond Street, in Hillcrest, at an open-air coffee shop called Filter, local artist, Cody Griffith, painted captivating, luscious purple tigers! As I understand it, the coffee shop provided Griffith the art supplies and allowed him to paint whatever he wished. Less than a mile away, at 425 Robinson Avenue, on the side of a building that houses Crest Café, Griffith painted a beautiful elephant with some of the same vibrant hues as in the tiger. In 2012, the owner commissioned this mural to commemorate the café’s 30th year in business. A little further east on University Avenue, Andrew Barajas and his daughter, Emma, painted an exterior wall of the Alibi Bar with the internationally recognized Before I die global campaign, first started by founding artist, Candy Chang. The wall holds the aspirations and dreams of many and is washed at least once a day, giving way for a new set of dreams to be documented. The giant chalkboard has 98 blanks that can be filled in by pedestrians on this busy corner, with provided, colored chalk . Watch this video for a smile. In North Park, at 3038 University Avenue, in the Undisputed Martial Arts Building, another ambitions and completely unique public art mural installation captured my attention. Signed at the top as Cat Cult, I later learned that this is a Los Angeles collective and collaborative group of artists who have an affinity for feline motifs. 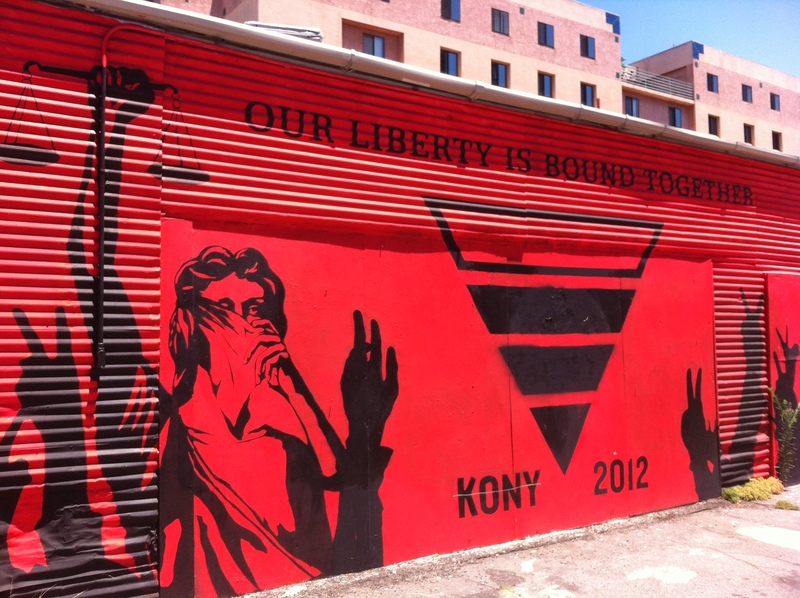 Vandalized twice in 2012, along the wall of Kelly’s Treasures Thrift Store at 815 University Avenue, a mural dedicated to the Kony 2012 campaign has been restored. Staff and volunteers of the Invisible Children Organization, initially painted this mural to bring attention to the crimes associated with Joseph Kony and the Lord’s Resistance Army in Uganda. A few weeks after it was finished in 2010, renowned street artist, Shepard Fairey’s OBEY mural was tagged with blue spray paint by an unknown culprit. Fairey may be best known for his Barack Obama “Hope” poster. Beautiful photographs, by Angela Carone/KPBS, documented this sad incident and below is a youtube video showing Fairey’s work in progress. I am fortunate to be able to enjoy this vibrant landscape and cityscape with my fellow San Diegans this summer. These large murals are big and bold and many carry a deeper meaning than what first meets the eye. I encourage you to walk around your own cities this week. Who are your local artists? 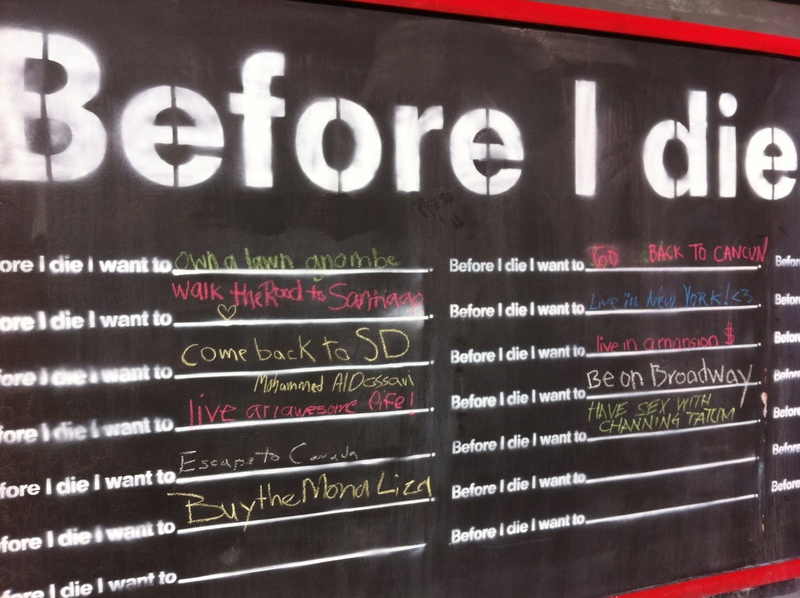 Can you devise a plan to get a mural painted in your neighborhood? I’m a journalism student who is writing a feature story for a class. 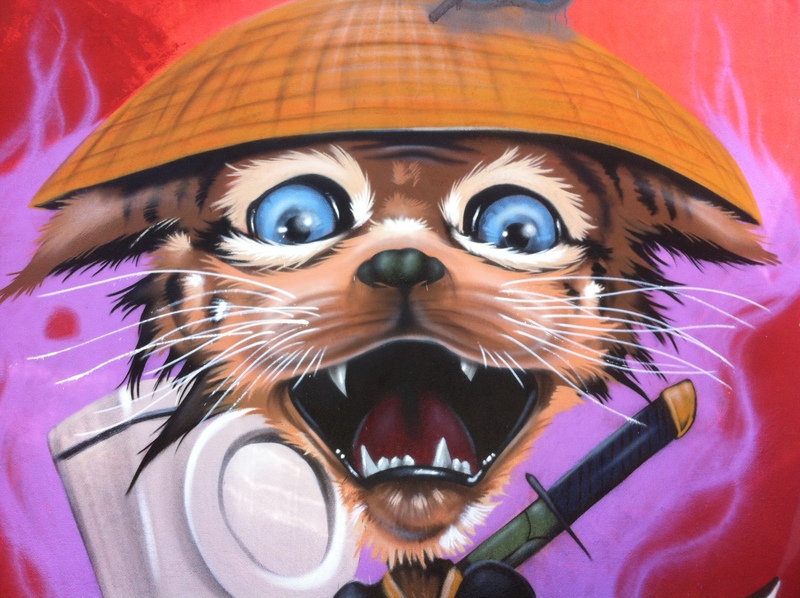 I’m focusing on the street art that fills North Park’s walls, as I recently moved there and find it intriguing. I am hoping you could tell me a little bit about who you are as an artist, and about street art: how do you think it affects the community and do you think it can send the message it intends? I thank you greatly for your time, and look forward to a response.The information I am requesting is time sensitive, so I would appreciate it profoundly if you could send me your thoughts as soon as possible for you. My email is: Shannonmarab@gmail.com, or a reply on this forum would be wonderful! Hi, Shannon! I just emailed you. Best of luck! Anita, I wish I was there to explore with you. What fun! Jimmie, that would be fun. It’s a great city to explore in! Great post Anita! Thanks for taking me on a little journey. I can’t wait until you explore Turkey! It’ll be fun to go there too, through your eyes. Thanks, Wendy! When is your blog going to be up and running? 🙂 I’m eager!